The U.S. sustained respectable apartment rent growth in 2018, led by some big increases in small markets. In fact, of the seven locales recording price bumps of more than 7% in the past year, five were not among the 50 largest markets. Sizable demand led to sustained occupancy rates and rent growth in the U.S. apartment market in 2018. For the year, prices grew 3.3%, in line with the cycle average. 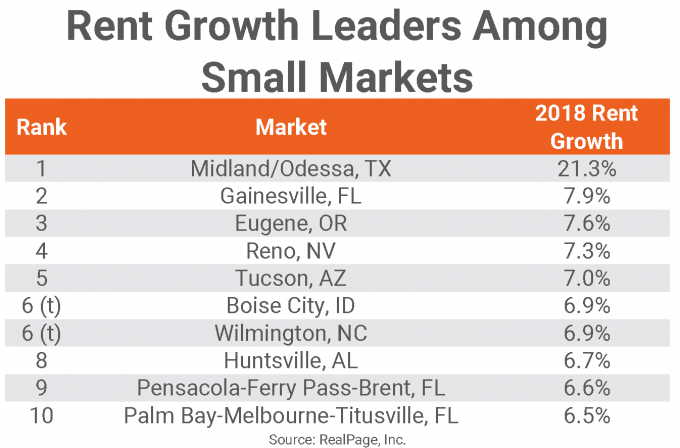 Midland/Odessa has been the nation’s standout for rent growth in recent years, logging extreme highs prompted by momentum in the energy sector. The Permian Basin relies heavily upon the volatile oil and gas industry, which is currently enjoying a production boom as it continues to recover from the fallout seen during the 2015-2016 bust. In 2018, rents were up by 21.3%. While significant by long-term historical standards and on a national scale, this annual growth rate was only about half the increase seen just a few quarters ago, when Midland/Odessa was logging annual price hikes at more than 40%. For perspective, those increases follow rent cuts as deep as 28% in 2015 and 2016, following the drop in oil prices. Gainesville, FL logged a price increase of 7.9% in 2018, granting this market the #2 spot among the nation’s 150 largest markets. This is the second consecutive quarter of annual increases above 7% for Gainesville, a record high for the market. In the past four years, annual rent growth has logged notable progress, averaging 5%, well ahead of the long-term historical norm closer to 2%. Helping rent growth here, occupancy has tightened, as supply – unlike in the rest of the nation – has remained modest in the current cycle. Recording rent growth between 7% and 7.6% in 2018 were Eugene, OR; Reno, NV and Tucson, AZ. In Reno, strong employment and population growth have led to a strengthening apartment base in recent years. In fact, the 2018 increase of 7.3% is behind the recent peak approaching 12% seen in 3rd quarter 2017, and a bit below the market’s four-year average of 9.3%. While deliveries ramped up in Reno in the past year, the nearly 1,600 units completed were almost entirely absorbed, leading to solid occupancy of 96.9%, more than a point ahead of the national norm. Tucson started seeing rent growth increase in 2015, when price hikes crossed the 3% barrier for the first time in eight years. In 2018, the market reached another milestone, with rent growth hitting 7% for the first time in over a decade. Occupancy in Tucson has been steadily improving since the beginning of the economic cycle in 2010. At the end of 2018, occupancy here was at 95%. A handful of secondary markets logged price hikes between 6.5% and 6.9% in 2018, including Boise City, ID; Wilmington, NC and Huntsville, AL, as well as two Florida markets: Pensacola and Palm Bay. For Wilmington, this was quite a big jump from the annual price increase of 3.4% seen here just a few months ago in 3rd quarter 2018. In fact, the last time rent growth was this strong was back in 2005. Occupancy has also seen quite an increase recently, going from about 95% in 3rd quarter to roughly 97% by the end of 2018. This sudden boost is likely due to increased demand after Hurricane Florence came ashore near Wilmington in mid-September 2018. Momentum has been building in Huntsville in the past five years. Rent growth here reached a record high recently, with an increase of 6.7% in 2018. This market hasn’t seen price hikes of this magnitude since 2005. Occupancy in Huntsville is tight at 96.5%, well above the long-term average. Palm Bay has been recording sizable annual price increases above the 5% mark since the end of 2014. The 2018 growth of 6.5% sits beyond the historical norm for this market, but below the decade peak of 9% recorded in 3rd quarter 2015. 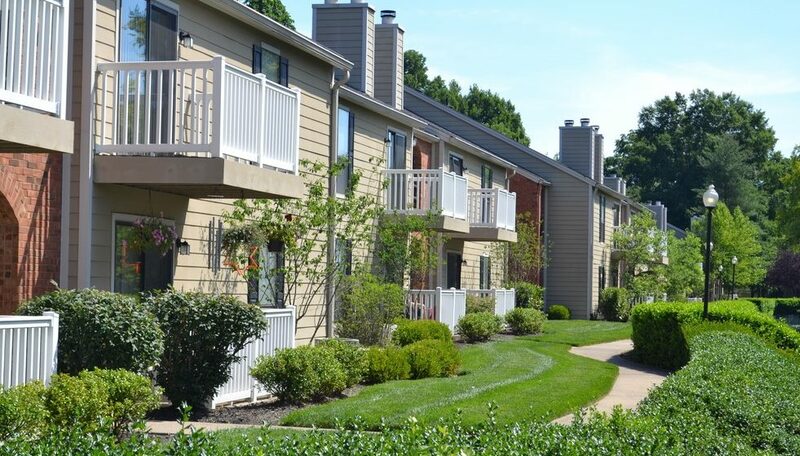 Paving the way for a strong rent performance, occupancy has been strong, standing at 96.4% at the end of 2018. This strength occurred despite new completions, which were mild, but not to what this area is accustomed. Between 2013 and 2015, this market didn’t see much of anything by way of new apartment supply. Only 303 units were delivered in Palm Bay in the past year, but that growth curve was way ahead of the norm. Just missing the top 10 list were Birmingham, AL; Daytona Beach, FL; Myrtle Beach, SC; Manchester/Nashua/Concord, NH; Lakeland, FL and Greenville/Spartanburg, SC, with rent growth between roughly 5% and 6%.